Why do we disagree with secular historians? The secular chronology is based on interpreting ancient clay tablets, writings, and inscriptions. 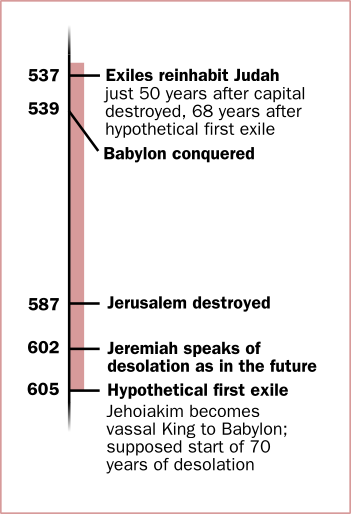 From these, they discern how long each Babylonian King ruled before the empire was conquered in 539 BCE. For a brief commentary on the secular evidence, see Appendix B. Counting back from that date, and adding up what they have discerned to be the reigns of each king, 605 BCE is found to be the first year of mighty King Nebuchadnezzar. Jeremiah says this King destroyed the city of Jerusalem in his 19th year of rule. Hence, counting forward 19 years bring us to 587 BCE. Incidentally, this is also the method Christendom uses. The prophet Daniel tells us, “Jerusalem will lie in ruins for seventy years.” (Daniel 9:2, Contemporary English Translation) However, the secular chronology disagrees with the Bible. Their chronology allows only fifty years – not seventy – from 587 BCE when Jerusalem was supposed to be destroyed, until the Jews returned home in 537 BCE. So, Jehovah's Witnesses will not accept secular chronology when it contradicts the Bible. 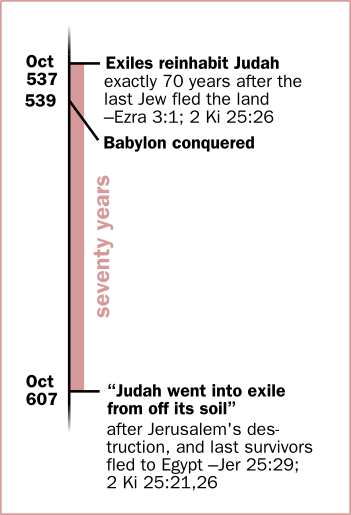 Hence, counting back from 537 BCE (the year the Bible says the Jews returned home) for a full seventy years, we arrive at the year 607 BCE. That must be the year Jerusalem was destroyed. 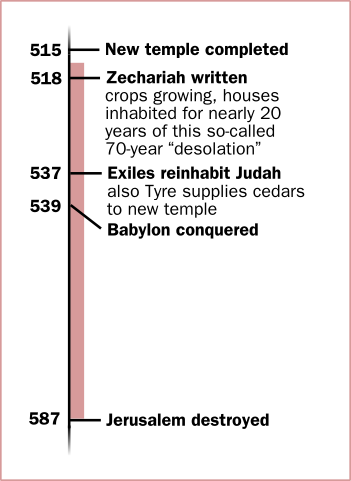 The secular date of 587 BCE, twenty years out, must be wrong. The following pages of this mini-site will show from other Bible prophecies why 607 BCE must be correct. The Bible says Jerusalem lay in ruins for 70 years. Secular historians, apostates, and Christendom say it was only 50 years.